Most people love having one off pieces, especially if it was a Vintage designer piece, but who wouldn't, make mine a Vintage Chanel handbag please. But unfortunately, if it's not a designer brand, many don't tend to shop vintage, they would rather go High Street. I guess there are a few disadvantages to shopping vintage, it's usually none refundable, the condition's not always perfect and rummaging through rails and rails of clothes can be off-putting. But saying that, there are more advantages and getting yourself some great bargains is one of them. I started shopping Vintage in my early 20's, mainly from the Topshop or Urban Outfitters vintage section where I mostly purchased accessories and maybe the odd dress. I then explored into areas like Camden and Spitalfields, and it was only last year I got back into Vintage again when I came across Brixton's Vintage Kilo Sale, you pay £15 for a kilo worth of clothes...amazing! I bagged myself two levis cut off's, two shirts and two t-shirts (here). 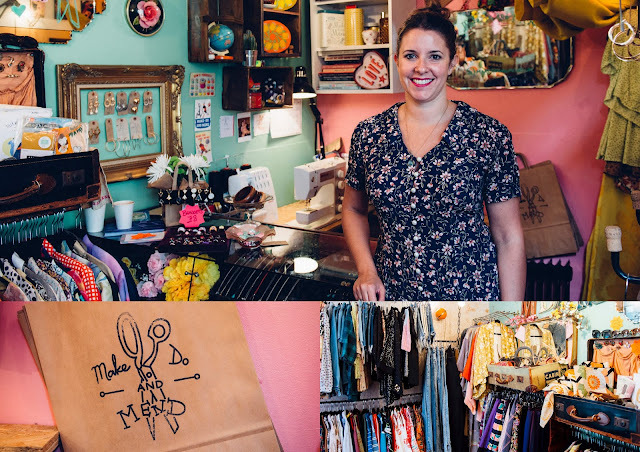 This year I was invited over by the lovely owner of Make Do and Mend, Sarah Bennett (Pictured above). She showed me around her shop and was very lucky to have been given a chance to find a kilo worth of outfits for free, obviously for me this was easy. I picked up two jumpers (here and here), a gorgeous striped dress and an Adidas tracksuit jacket (here). Following her kind gesture, I decided to do a post on Vintage and asked Sarah on the day if she would be happy to answer a few questions. Hi! I’m Sarah and I own Make Do and Mend, a vintage boutique and alterations company based in Brixton, South London. We sell vintage clothing for both men and women from the 1950’s to the 1990’s (yes the 90s is considered vintage now!). All our vintage is handpicked and we travel as far and wide as we can to bring you our unique collection of clothing and accessories - all at affordable prices! As well as our clothing range we run a successful alteration service which is offered for anything you find in store or you have at home – we believe in reusing and recycling the fashion that already exists whether through selling vintage and repairing and upcycling what you have! We run sewing workshops, vintage and makers markets and we currently run the very popular Brixton Vintage Kilo Sale. I opened the shop in Pop Brixton nearly two years ago after starting life selling on market stalls in the local area and at vintage events. I also live in Brixton with my fiancé Alex! Before starting Make Do and Mend, I worked in Costume in the West End for about 10 years, working on shows such as Les Miserable, Hairspray and War Horse. I absolutely loved working in theatre and I had some of the most incredible experiences but I had always had a dream of owning my own business and having a shop. So about 4 years ago I did a business course, then started up the market stall. I then read about a new start up project for local businesses and residents – Pop Brixton. So I applied, secured a space and we have been open ever since - which was nearly two years ago now! I really started getting into vintage when I was a student at university. But as a child I had always loved going through my grandma’s wardrobe, trying on all her jewellery and fur coats! I lived in north London as a student and we had the most amazing charity shops which me and my friends would scour on a weekly basis! We would find incredible pieces for next to nothing. We used to try and get in the shops first to get the best bits! I was hooked from then. The thrill of finding something amazing for a bargain, knowing that no one else would be wearing the same as you is a feeling I still get a buzz from! 3. Why do you think more of us should shop Vintage? There has been a huge positive shift in recent years around sustainable and ethical fashion and people are much more aware of how and where they are buying their clothes from, while also wanting to be fashionable and on trend. I think buying vintage fits the bill for that perfectly. You are buying clothing that already exists and in general, is actually made much better than their modern counterparts! There are some bigger vintage companies out there but generally when you buy vintage you are supporting small independent business who are passionate about what they do. Buying vintage is also so much more fun! Vintage is still a huge trend on both the high street and on the catwalk, year on year. Why buy the copy when you can find the original! 4. What one piece of advice would you give to my readers who want to shop Vintage but not sure what to look for or where to begin? Whether shopping in a store or online don’t be put off by the amount of items there are for sale! Every vintage item is different so vintage shops tend to have a lot of items in them compared to modern stores. Perhaps pick one item that you are looking for when shopping vintage. One of our consistent top sellers are vintage blouses. They are so easy to wear, affordable and can be worn with almost anything. We have a huge variety of prints, colours, patterns and styles in our store and they are such an easy way into wearing vintage. You can wear for work with trousers or tucked into a skirt (they are especially great with a leather skirt!) dressed up or down with jeans at the weekend. I wear mine usually buttoned all the way up with a statement necklace, tucked into skinny jeans with boots. We sell them a lot to shoppers who don’t normally buy vintage; because they are affordable, versatile and often much cheaper than the modern version sold in high street stores. 5. And lastly what's your favourite Vintage piece you own? Ooh, a tough one as I have a LOT of vintage in my wardrobe and I love it all – haha. I tend to keep items as they remind me of a certain place or time but I would say my favourite is a beautiful fitted 1950s dress I bought when I had not long been working full time. It was in this tiny little vintage shop in Muswell Hill where I was living at the time and I fell in love with it. I saved up and bought it and every occasion I could I wore it. It needs a bit of tlc now as I’ve worn it to death but I still love it. Every now and again I wear it and feel amazing when I do! The fit, the colours, the style – it’s just perfect! I don't know about you, but Sarah's answers have made me want to shop vintage more. Celebrities like Alexa Chung and Fearne Cotton are just a couple that shop vintage, but if anyone wants some daily inspiration on Vintage clothing Emily Hamilton from Vintagemumdiary is a good one to follow on Instagram as she is vintage obsessed, as well as trainers and fashion. If you do fancy going to the next kilo sale check out www.mdam.co.uk or follow the store on Instagram for updates. Sarah does alterations too in her shop, so don't worry about the fit as I'm sure she can help you out. Sarah's shop is situated minutes away from the northern line or southeastern rail. Have a day out there, you'll love it. Thank you for reading and thank you to Sarah for agreeing to do this interview.